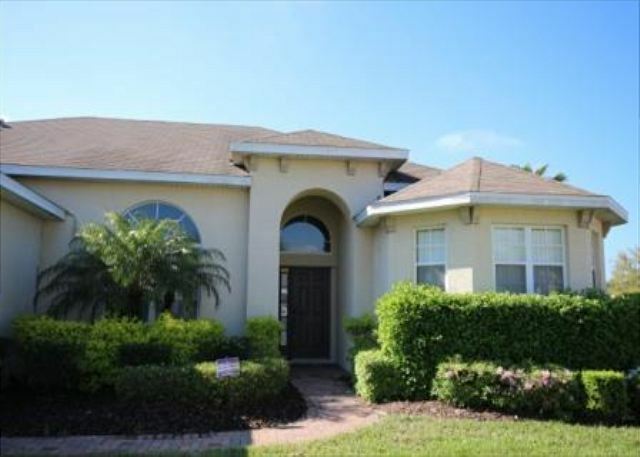 All Suites Manor is an amazing 5 bedroom 5 bath home located in The Manor at West Haven. 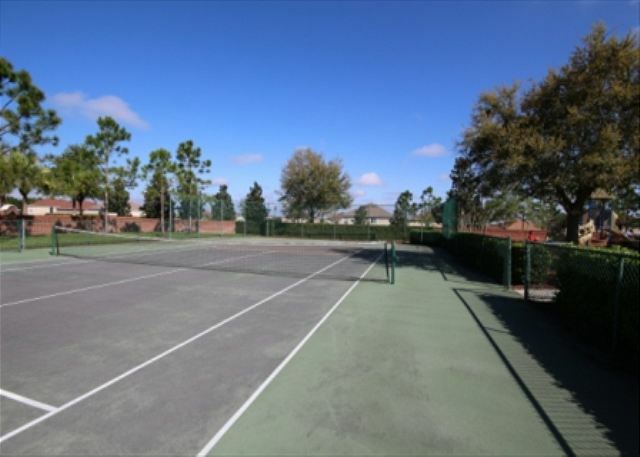 This Manor is an upscale gated community with private tennis courts just minutes from ChampionsGate Golf resort and all of Central Florida's major attractions. All Suites Manor is beautifully decorated with high end furnishings and offers all the comforts needed for the perfect vacation rental. 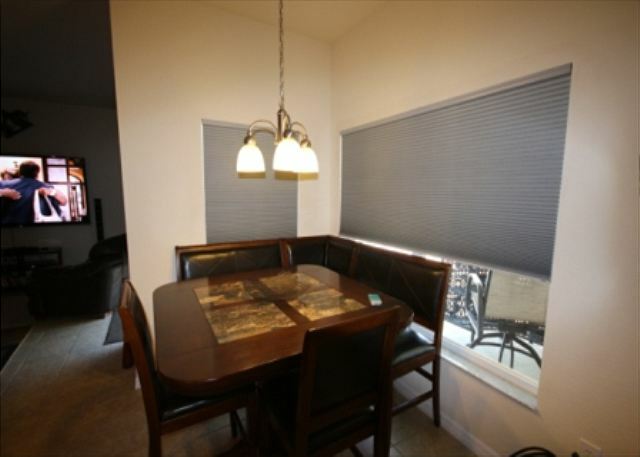 This spacious 2,500 square foot home offers plenty of dining and seating options to make everyone feel at home. 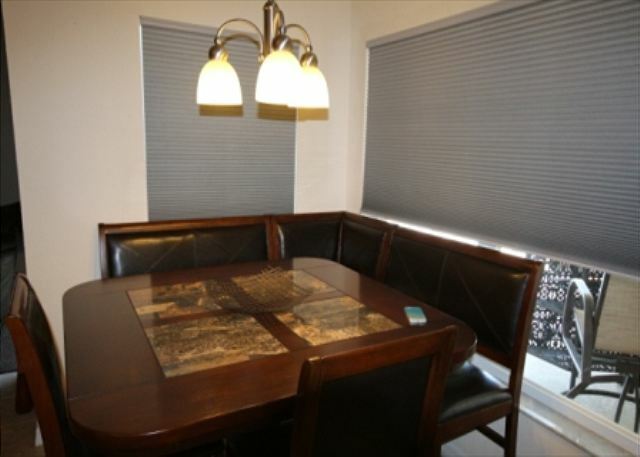 Whether you are looking for a formal meal in the dining room or a quick breakfast at the counter or in-kitchen eating, this home provides the perfect setting. The large kitchen has plenty of storage and counter space for cooking. 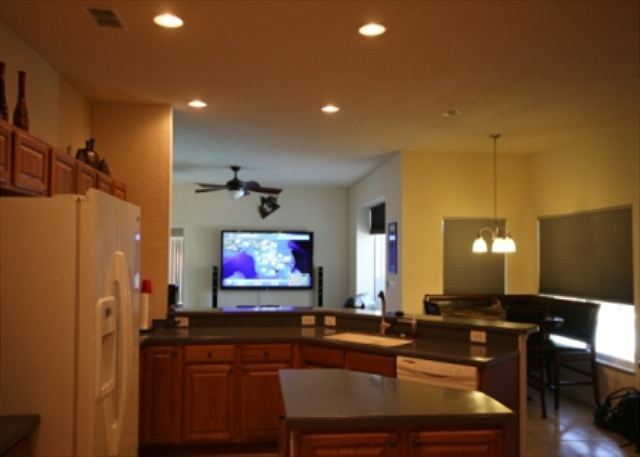 The family room is open to the kitchen and offers the best in home theater experience you could want in a vacation home. Take your family movie night to a whole new level with comfortable leather sofas, surround sound and a gorgeous 80” flat screen TV! If you would prefer a quiet evening, the living room provides a comfortable sitting area to relax and enjoy as well. Each of the 5 bedrooms is outfitted with a king or queen bed, a flat screen TV and has a full en suite bathroom. The main master bedroom is split from the rest of the home with sliding doors to the pool area and a bathroom complete with his and her sinks, a walk in shower and garden tub. The second master bedroom is located on the second floor of the home and offers a complete master bathroom similar to the one downstairs. One of the other downstairs bedrooms has a connection to a full bathroom with pool access. Whether you want to lounge in the sun or relax under shade, the large pool deck offers a spacious covered lanai and plenty of sun loungers. 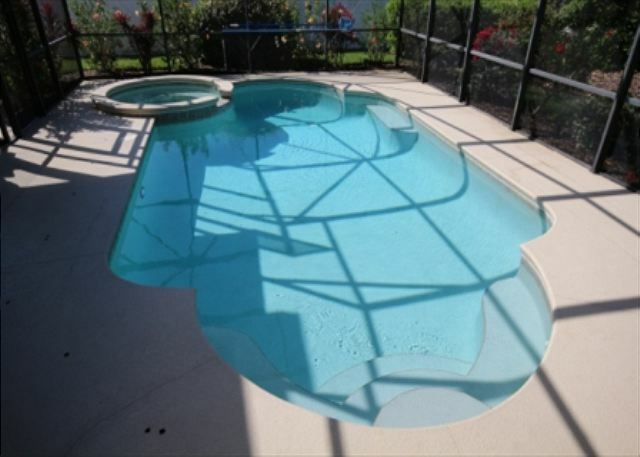 The large South-facing pool and spa run on a salt filtration system and has both solar and electric heating! 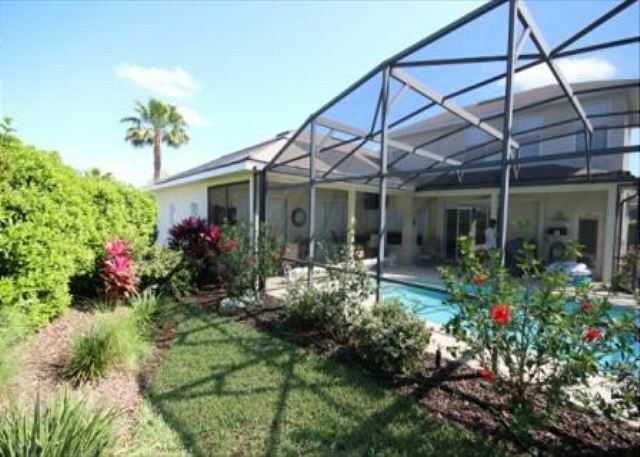 The yard is beautifully landscaped offering extra privacy in the pool area! When you stay at All Suites Manor you will enjoy complimentary wireless internet and long distance calling in the US and Canada! You deserve the best on your next vacation, and All Suite Manor has it all to make this your most memorable vacation! Wonderful can only half describe how great our time was at All suite manor. Very nice rental. Clean, quiet, private gated community. We were impressed that the owner called us to see if everything was ok. Very nice owner. Overall the property met all of our expectations. We had a great time and would rent this property again. Wonderful house. 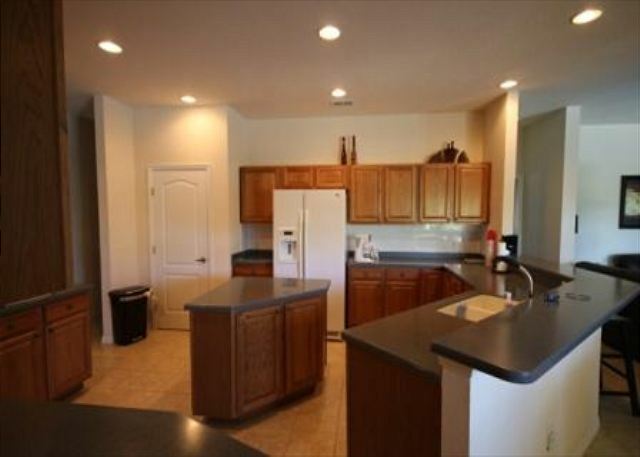 Extremely well appointed kitchen, has everything you would ever need just like your own home. Description should say that Bar-bq is to be used which then would save prearranging a separate rental. The ONLY thing managing company should check would be all tv’s work (2) in bedrooms did not work. Provide instructions for each tv. 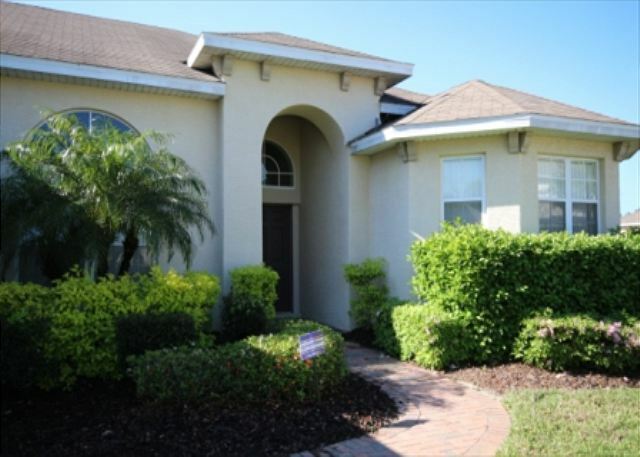 Overall loved the house and already have recommended to friends who have rented the house for January golf trip. Stayed in June 2016, this was our second time using Florida Spirit. Everything was beautiful and we really enjoyed our stay. We would definitely stay in this home again! This was our second time using this house. Layout is perfect. Everyone has their own space. The pool and deck are totally surrounded by trees and flowers for complete privacy. We would definitely use this house again. "Everything in good condition, would love to stay in the same home around the same time next year. We were very happy with the place. 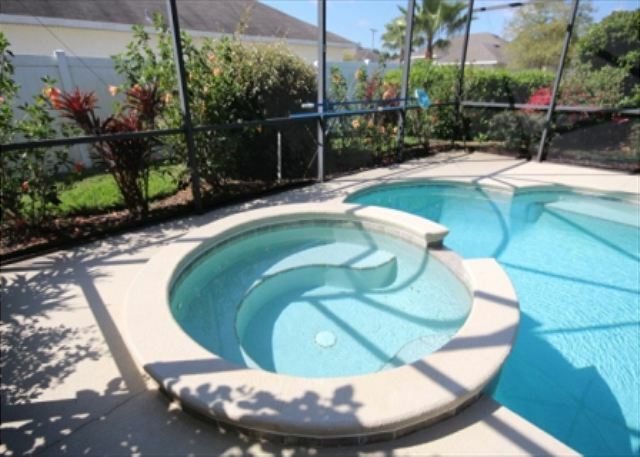 Thanks so much.the only problem was the hot tub issue,other than that we loved it." I have rented 5 other houses in this community over the past several years and all were very nice and safe. However I must say that this home worked better for 9 adults because of it's layout. Master bedroom on the second floor and the other 4 bedrooms are so widely separated that the privacy for each was complete. I had never experienced a salt water pool and I really liked it. The salt wasn't noticeable but the absence of chlorine sure was. The bonus was the privacy of the pool deck. Totally surrounded by beautiful landscaping. We are already planning our return. We had an amazing five day stay. We were 6 adults and 3 children. The house is so spacious and was perfect for what we needed. 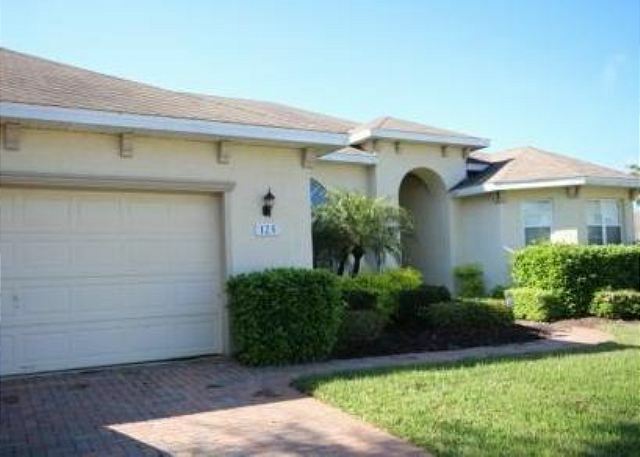 The location is good and close to the highway, Disney, outlets and all other attractions are within a 30 minute drive. We were surprised by the size of the house, the photos don't do it justice. Everything is updated and stocked with all that you need. The large kitchen is great when traveling with kids. The pool and hot tub were also a nice addition. Our kids enjoyed playing in the park that is just across the street. We will be back for sure. I would like to start by saying what a pleasure it was staying at your villa in The Manors. The villa provided us all with everything we needed and more, especially the easy ground floor layout and extensive pool area. In all our vacations in West Haven over the last 6 years your villa was absolutely perfect and the best - clean, spacious, conveniently located and packed full of facilities. 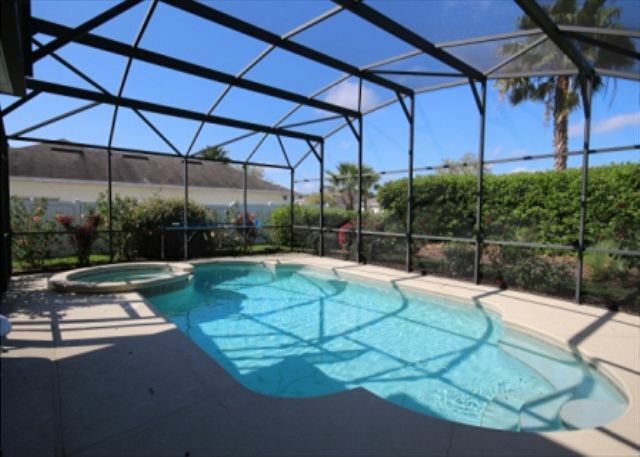 One of the key reasons we choose to rent top class villas in Florida is to ensure executive style living accommodation together with the fantastic pool essential for us all, especially the kids. The owners provide brilliant communications throughout ensuring people are always kept well informed of all aspects expected of a rental. We will be back!! Another West Haven community, The Manor is a beautiful gated neighborhood located on the highest point of the West Haven subdivision. The Manor features 4 and 5 bedroom vacation rentals that are skillfully decorated and just a short walk to the tennis court and playground. Conveniently located in the ChampionsGate area, the community is just miles from two 18-hole golf courses designed by Greg Norman, a Publix supermarket for all your grocery needs, and a variety of restaurants for your enjoyment. All Disney parks are within a 15 to 20 minutes drive and just 25 minutes to Universal Studios, Island of Adventures, and Sea World.